Welcome back to our last comic review of the week. Yup, it’s been busy and our friends at Vibranium Comics and Games just keep em coming so a HUGE thank you to them for working with us again in this new year! Be sure to keep giving them love on facebook so they want to keep supplying me with comics to review for you! You can check out their facebook by clicking the banner below! This next review is short and sweet just like the last one but for much different reasons, so keep reading to see my take on a new Star Wars comic! 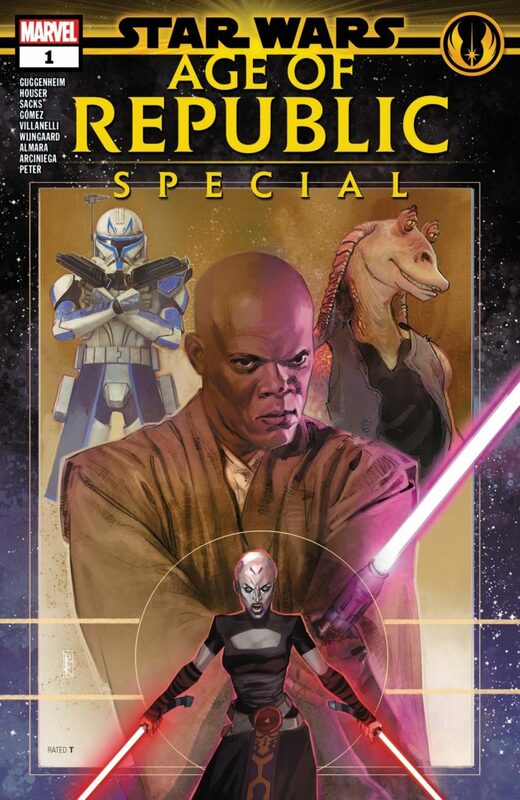 So the last one we have for you this week is a comic called Star Wars Age of Republic Special. Like I said though this is going to be a quick little blog because honestly, if I say too much about the comic it will spoil the entire thing for you and while I do tend to give some things away in comics I try not to spoil them too very much! The reason saying much about this would give too much away is because this comic was made up of a few little short stories. One about Mace Windu (good one), One on Asaj Ventris (Great one) and one about Commander Rex and everyone’s “favorite” Gungan Jarjar Binks (ok one). So I had mixed reactions to the stories as you can see by my little blurbs, they ran the gamut from “Great” to “Meh it works”. The stories were short but as I’ve seen from Marvel before they worked as stand-alone good stories even though they are short. The artwork was great, I LOVED the nod to the 501st they put in the one with Commander Rex as I am a huge fan of that costuming group in real life. Yes, Jarjar is still annoying and yes I still don’t hate him like everyone else does. I will say if you like the prequel characters (not necessarily the stories but the characters) then you should like these little shorts and I recommend running out and getting this. Even the Meh one I enjoyed which is more than I can say about most Meh things but it was only Meh as compared to the other stories if that makes sense. If you enjoyed this comic (or not) sound off below and let me know why (either way). I love hearing from you guys and maybe even give me some ideas of things to review for you in other blogs! If you want to support what we do here be sure to check out our online store once we get it running or if you just want to make a donation feel free to drop by Ko-fi.com/thalra. Next Kittens Rant: WWE Whose the good guy again? Hey Kevin! I have really enjoyed all of the Age of the Republic stuff so far. This wasn’t as good as the Qui-Gon one by far though. Personally I had enough JarJar in 1999 but to each his own.? I did liked the Mace Windu story. The Ventress story was good, but not as great as the first one. I wanted a solo Rex story, but it was still good with Binks (This issue will get the Darth Jar Jar fans talking)? Kevin…I really enjoyed your review. And your point of view. Keep them coming. I will be your number one reader. Would love to see you come back! We always enjoy good conversations with our readers! How Did Nick Fury Lose His Eye in the MCU?